BOSTON (AP) — David Bailey stood on the sideline waiting for his chance. 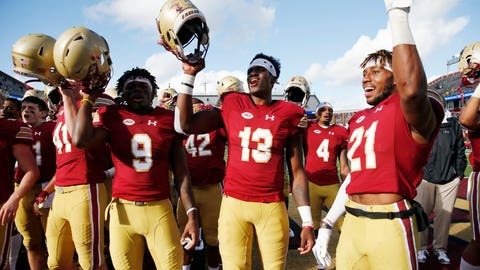 When it came, he made Boston College forget about the loss of injured star running back AJ Dillon, if only for a little while. Bailey played some in blowout wins over Massachusetts and Holy Cross in the Eagles’ first two games, but was back on the bench with Dillon and Glines carrying the running load. Freshmen can play in four games before the option of redshirting is lost, and it’s possible the school wanted to keep that option available. Jawon Pass was 17 of 31 with 170 yards and ran for a TD for the Cardinals (2-5, 0-4). It was Louisville’s fourth consecutive loss. Bailey’s 1-yard TD run made it 31-20 early in the fourth quarter after BC passed on a field goal attempt and converted a 4th-and-4 at the Cardinals’ 23. Colton Lichtenberg’s 38-yard field goal with 4 seconds left gave BC a 24-20 halftime edge in a first-half filled with big momentum-shifting plays and turnovers. Malik Cunningham’s 1-yard TD run came after Glines’ fumble at the Eagles’ 6, but the extra point was blocked. On the ensuing kickoff, Michael Walker fumbled and Hassan Hall’s 3-yard scoring run capped a 40-yard drive. BC regained the lead when Nolan Borgersen blocked Mason King’s punt. The ball bounced into the end zone where Levy recovered it. He scored off a blocked punt last week in the Eagles’ loss at then-No. 23 North Carolina State. The Cardinals moved ahead 20-14 on Pass’ 3-yard run. The ACC’s preseason player of the year has averaged 159 yards per game in his last 12.